While All Eyes are on the Weekend… I’m More Interested in March 13th – 15th! An arctic front will bring another wave of bitterly cold air into the Washington Region Friday night as temperatures plummet into the teens overnight! Rain showers are likely out ahead of this arctic front Friday morning in the DC Metro with an eventual change over to a period of snow showers before precipitation ends around noon. 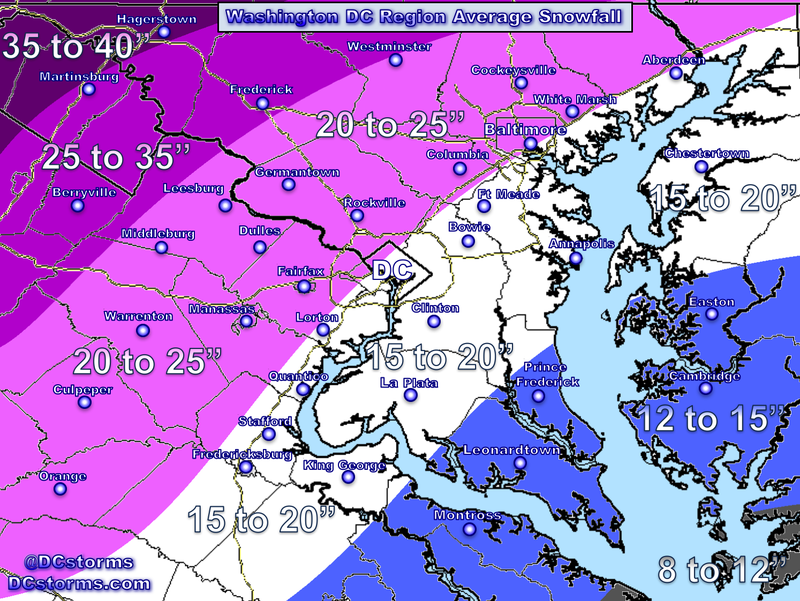 Northern Maryland could even see some snow accumulation as colder air bleeds south out of Pennsylvania into our region. Then all eyes turn to an upper-level disturbance currently over the Pacific Ocean and its exact track during the Saturday night into Sunday time frame. The latest forecast models have all shifted the storm track well to the south of the DC Region with light snow currently looking most likely across the southern half of our region. 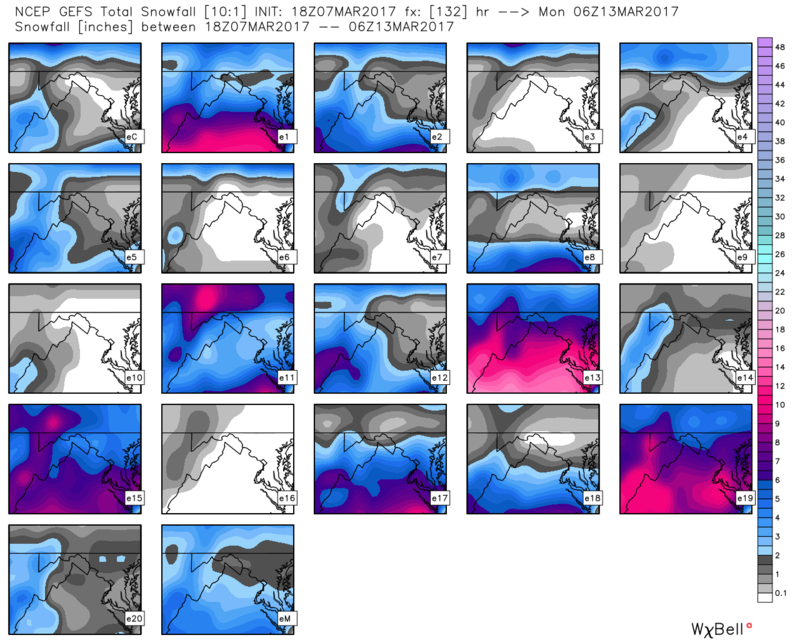 Keep in mind that several ensembles still clip the DC Area with accumulating snow so we can’t write this system off completely until Thursday when the forecast models will begin to have a much better handle on exactly where this feature tracks. Uncertainty in exact track still exists and this storm system could start to creep back north providing steady accumulating snow to our region. 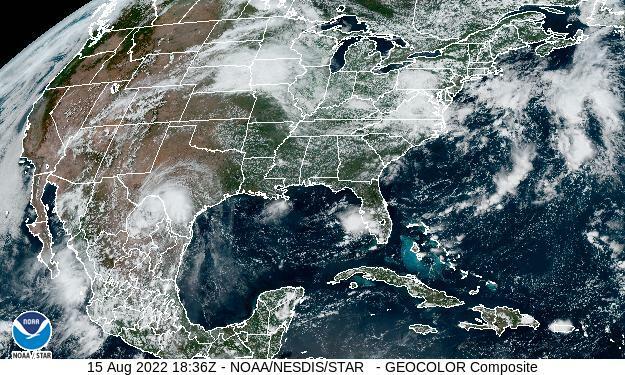 Right now it looks like a 50% chance it could go either way (I am with-holding judgement until Thursday when the upper-level disturbance I am tracking reaches the coastline of the Pacific Northwest). I do not foresee a favorable upper-level pattern this weekend for a “slow, moving Nor’easter”… if this is what you are hoping for… you’re wasting your time as the upper-level flow is extremely progressive (that is a fast west to east flow aloft meaning storms that form will be zipping through quickly). Still, if this system were to creep north, the temperatures are cold enough and the snow ratios would be high enough where it wouldn’t take much moisture in the atmosphere to produce a fluffy, accumulating snow. – Canadian Model (image below: GEM) was the first to show a suppressed storm track for the weekend system. It was also the first model to hint at a Nor’easter during the March 12th-15th time frame. 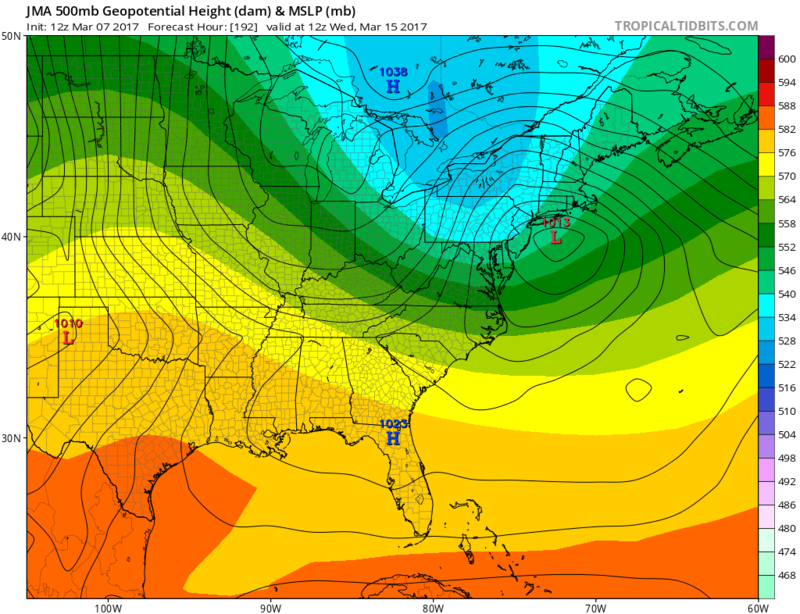 The European model and GFS have begun to latch onto this idea of a more suppressed storm track over the weekend followed by a potential coastal storm developing behind it as an incredibly deep trough plunges into the eastern United States with bitterly cold air pouring in out of eastern Canada. (I can picture the ground-hog laughing at all the fools who declared that Winter was over… yet our magnolia blooms have been burnt by last weekends widespread hard freeze and everything else in bloom is getting ready to get burnt on Friday night). The image below from the 12z Canadian if it verifies shows the true definition of “Bombogenesis” — when a mid-latitude cyclone rapidly intensifies along the Gulf Stream of the Atlantic Ocean with rapidly falling pressures. So I can hear the naysayers now… “This is a week away… why even mention it?” Because most of the model suites are currently in agreement of a coastal storm forming along the NC coast and then riding up the eastern seaboard. Does this mean it is guaranteed? Of course not, but I have NOT seen a pattern this interesting all “Winter” long. 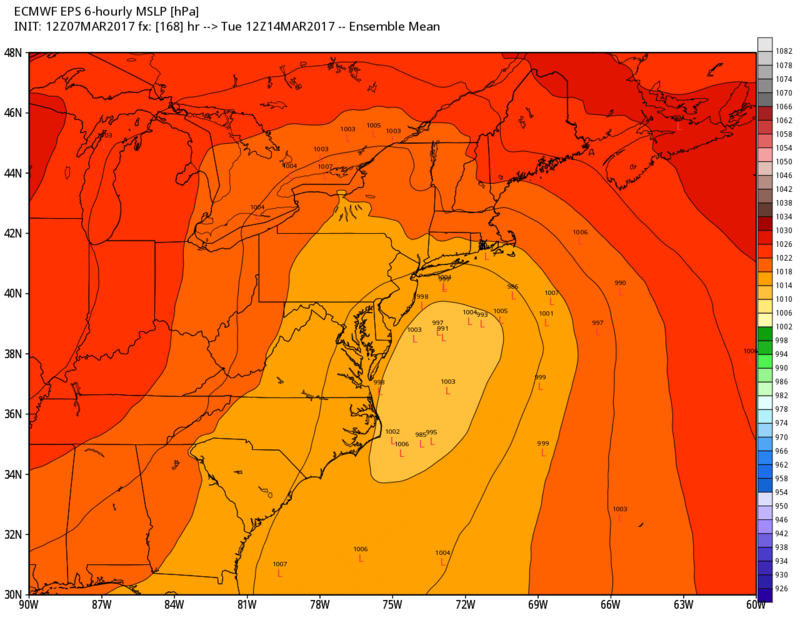 All those little “L”s sitting off of the Mid-Atlantic coastline on Tuesday morning, March 14th… hmmmm…. if this does form and tracks close enough we may be digging out from our first major winter storm of the season. The point I am trying to make is that while we have been burned before this winter (hint: this past January when the Tidewater of Virginia got slammed and DC got a measly inch)… we might get burned again this weekend if the system favors central and southern Virginia keeping DC cold and dry. But sometimes… just sometimes…. the third time is a charm… and it would be not only hilarious but wonderful if the “third” system is the storm that buries the DC to Boston corridor early next week. While there are no guarantees we are certainly heading into a very Wintry pattern shaping up with lots to watch over the next 10 days. Buckle in for a wild ride. Winter isn’t over until it’s over! I was in “Gator City” Florida on March 13th praying a tornado wouldn’t level my parent’s home at 3am in the morning… while drooling over the ‘cosmopolitan’ weather slamming the northeast. A bit like March 1993. 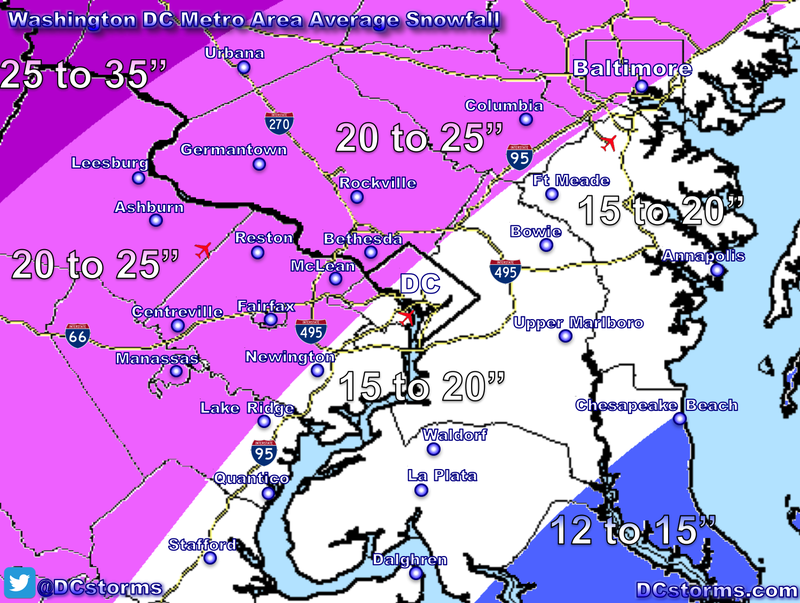 Now if that storm had gone 50 miles further east, DC proper would have received 20″ on March 13th. I “cheated” and saw the storm in Frederick, MD where there was 20″ with 50 mph winds. Only sleeted for 15 minutes. I returned to Frederick 5 days later and there were still 6-8 foot snow banks along the city streets despite the high March sun angle.